Customer service you’ll actually love! Book online or call us today to schedule your appointment, and we guarantee the best price for high-quality dumpster services! When to Rent a Dumpster for Residential Use? Homeowners throughout Chicagoland can rent a dumpster to help tackle a wide number of renovation projects and cleaning needs. If you have junk that won’t fit in trash bags, or there’s simply too much debris to place in your normal trash collection, dumpster services offer an easy and convenient solution. When you need to get rid of a lot of junk, you have a lot of options. You could schedule junk removal by our Chicago junk haulers and get a full-service cleanout. 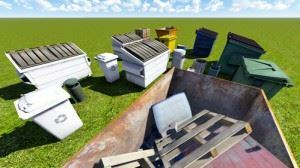 But you might prefer the flexibility of having a dumpster outside your house so you can fill it over the course of your cleaning project or renovation. Dumpster services also let you get rid of everything all at once. Rather than scheduling a bunch of donation pickups and driving your car or truck around to various landfills, you can fill a Junk King MINI dumpster and we’ll take care of the rest, including recycling. So, what sets Junk King apart from your other choices for dumpster services in Chicago? For starters, we’re the #1 rated junk removal company in North America! Our customers enjoy a pleasant experience from the first phone call to the final wave goodbye. Don’t make the mistake of thinking that all dumpster services are the same. Some of the other guys will nickel and dime you with surprise fees. Junk King lays it all out in our dumpster rental pricing. We are also the first to offer “pay per use” pricing for dumpster services. Our 12 cubic yard MINI dumpster is actually more than some projects need. We have a low minimum rental charge and reduced rates for containers that are less than full — so your cost is tied to how much junk you need us to haul away. What’s Included with Dumpster Services? Junk King offers dumpster services throughout the Chicago area, from the Loop to the outer suburbs. Get the convenience of a dumpster rental along with the peace of mind that the Junk King MINI is safe for your driveway! Book online now or call us at 888.888.JUNK (5865) to schedule a Chicago dumpster rental service by the friendly team at Junk King! This entry was posted in junk removal and tagged Chicago Hauling, Chicago Junk Hauling, Chicago Junk Removal on June 28, 2017 by Julian Torres, "JT". Last updated August 13, 2017 .